With the increasing demand of oil resource, the oil drilling industry is experiencing prosperous development, leading to the development of the oil drilling tools such as centrifugal pump and stack sizer. However, why the centrifugal pump is so popular among oil drilling industries and why choose centrifugal pump for most users? The main reason is due to the advantages of the centrifugal pump. The biggest advantage of centrifugal pumps is their structure. They don’t require any valves, or many moving parts. This makes them easy to produce with many different materials. It also allows them to move at high speeds with minimal maintenance. Their output is very steady and consistent. Most of all, the centrifugal pump has little occupation space and light weight, leading to less material consumption. And it has low requirements to the basic requirements, so it has less manufacturing and installing cost. Centrifugal pumps are unique because they can provide high or very high flowrates (much higher than most positive displacement pumps) and because their flowrate varies considerably with changes in the Total Dynamic Head (TDH) of the particular piping system. This allows the flowrate from centrifugal pumps to be “throttled” considerably with a simple valve placed into the discharge piping, without causing excessive pressure buildup in the piping or requiring a pressure relief valve. Therefore, centrifugal pumps can cover a very wide range of liquid pumping applications. For most household or light industrial uses, a centrifugal pump is fine. As long as the liquids aren’t too viscous, like mud or waste, and the pump can be totally submerged, it will provide consistent, effective, and reliable operation. In addition, the centrifugal pump is able to operate with high speed by using direct connection of several eletromotor, leading to easy installation of the transmission device. 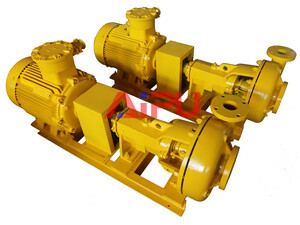 The centrifugal pump is a kind of necessary device in oil drilling industry. Generally speaking, if you want to need or get more details in your application we hope you come to Aipu solids control to discuss your application with our engineers. How to maintain drilling mud decanter centrifuge?